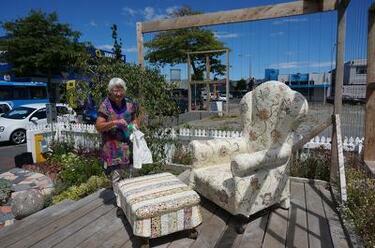 A photograph of Crack'd for Christchurch's armchair and ottoman artworks in the Green Room garden on Colombo Street. 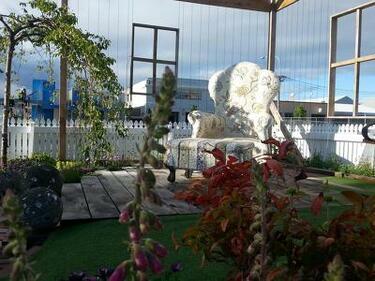 Crack'd for Christchurch comments, "Flora and Otto in their lovely garden, made up of plants and materials salvaged from the Christchurch Red Zone." A photograph of Helen Campbell repairing Crack'd for Christchurch's armchair mosaic in the Green Room garden on Colombo Street. A photograph of Helen Campbell in the Green Room garden on Colombo Street. 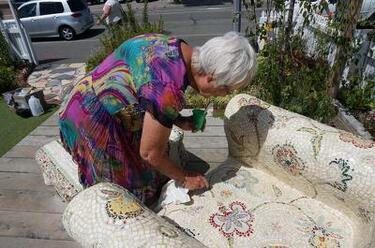 Helen has been repairing Crack'd for Christchurch's armchair and ottoman mosaics.